During last month’s trip to London for my brother’s wedding, Carol and I took a long side-trip down to Cornwall to visit with my sister-in-law’s family and visit some of Cornwall’s many scenic attractions (as well as learning the joys of barreling down narrow Cornish B-roads at 50 mph, a treat not to be missed…). And no visit to Cornwall is complete without at least one sampling of the hallmark of Cornish cuisine: the pasty. For those that aren’t familiar with the pasty, a basic pasty is a filled short pastry crust, folded in half around a filling, crimping the edge to form a seal. Typical pasty filling is usually diced meat, sliced potato, onion, and rutabaga (aka “swede” or “yellow turnip” in some parts). The result is similar to a pot pie, although the particular construction and composition of a proper pasty does give it a bit of a distinctive texture. However, another hallmark of the pasty is the cultural heritage that goes with it. Shortly after my brother’s introduction (through his Cornish wife and his many visits to Cornwall), he started regaling me with many stories about pasties (including the particular pronunciation, “pass-tee”, and not “paste-ee”, which is another item altogether… 🙂 ). How the pasty was originally made as lunch for Cornish miners, who needed a self-contained meal that they could eat in the mines, holding onto the crimped pastry so that they could eat the majority of their meal without their grimy fingers messing it up. How some miners would warm their pasties on a shovel over their lamps. How some particularly adept Cornish wives would compartmentalize their pasties into a “meat”, “vegetables”, and “fruit” sections. However many pasties would be personalized with various stamps and patterns (a technique still used today by many vendors to differentiate pasties with different fillings). However, the interesting thing about all this stories is that I had heard them before, many times, identical down to the subtle details. Since, it turns out, one of Cornwall’s particular historical exports over the last several hundred years has been miners, and wherever Cornish miners went (which includes Minnesota’s Iron Range and, more famously, the Upper Peninsula of Michigan, but also Spain, Mexico, and Australia), they brought their pasties with them. Having lived myself for several years in both Michigan and Minnesota, I’ve had plenty of exposure to the pasty and it’s heritage already. Indeed, on any of my trips through the UP, I’ve eaten many a top-notch pasty made by good people of Cornish (and some Finnish) decent. Admittedly, however, by the time you get down to southern Michigan, the quality seems to have suffered a bit, mostly becoming a differently-shaped pot pie. In any case, having found myself traveling to the UK (including a trip to Cornwall), it was nice to be going back to the source of pasties. 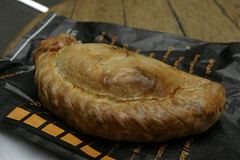 They’ve definitely had a resurgence, outside of Cornwall many companies are marketing pasties to the public. For example, most every major train station and some of the larger tube stops in London sport stands from the West Cornwall Pasty Company (where the picture at the top of this post came from), with an impressive array of different pasties available for consumption. nterestingly, in the attempt to broaden the appeal of the pasty, a wide variety of fillings are available, ranging from the classic pasty, my above-pictured steak and ale pasty, the steak and Stilton one Carol ate, and lamb and mint. However, I rather like the pasties from West Cornwall Pasty Company, with a nice flaky but substantial crust, and a good savory filling. Understandably not 100% pure Cornish, but a good pasty nonetheless. As an extreme example of fillings, West Cornwall also makes Chicken Tikka Masala and Chicken Balti pasties (which, considering that both of these dishes are English-corrupted Indian dishes, makes the Chicken Balti Pasty a doubly corrupted creation). That said, however, the Chicken Balti pasty was actually pretty good, although left to my own devices I’d probably call in an empanada and not a pasty. However, telling one’s Cornish hosts that you’ve been eating train station pasties gets you a slight bit of scorn, and, in my case, some elaborate instructions on where to go in Cornwall for a proper pasty. Indeed, on our first day of tourism, we planned to go to Tintagel on the coast, and then inland to Camelford to score a good proper pasty for lunch. Alas, our visit to Tintagel was a bit longer than anticipated, and we arrived in Camelford just as the Cornish Maids Pasty Bakery (recommendation #1) was closing up shop, and just after the Masons Arms Pub (recommendation #2) had dispensed their last pasty, forcing us to explore the local economy. And, indeed, the local economy delivered, Four Seasons Tea Room down the way still had plentiful pasties (at right). A good pasty and a nice lunch, although not quite the level of pasty that I was hoping for. I’m looking forward to my next trip to Cornwall to make another stab at sampling some good Cornish Pasties. hi there, so sorry to read that you missed us, (cornish maids, pasty shop, C amelford) , and would like to suggest that you give us a call next time you are in the area, and maybe try our new “miners ” pasty, which we have just put on our MADE TO ORDER menu. Thanks. I’ll make sure we don’t miss you on our next trip. My Cornish hosts were most disappointed that I didn’t make to your pasty shop. (Closed) Since Brooksie’s in Sharon, VT burnt down a few years back, I haven’t really been back to eat in town. However, several times driving between Sharon and Royalton I noticed Dixie’s and an ice cream stand, and figured that at some point I’d try them out. Well, this weekend, Carol and I had to go up to Burlington, so this was a handy opportunity for us to check out Dixie’s. Myself, I had to do my regular order of Biscuits and Gravy, while Carol had a stack of pancakes.